LAKE JUNALUSKA, N.C. – The birthday celebration may be winding down for Lake Junaluska, but its 100th anniversary will long be remembered, thanks to a $114,000 donation by the Junaluska Associates. The money is earmarked to help refurbish and add a new conference center to Lambuth Inn, a historic structure built in 1921, the center section of which is listed on the National Register of Historic Sites. The popular site offers panoramic views of the lake and the Blue Ridge Mountains. 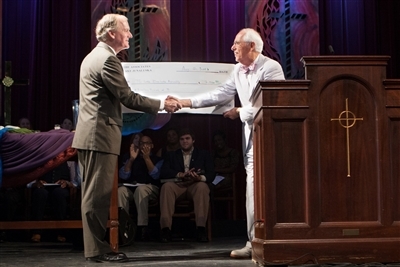 Jack Ewing, Lake Junaluska Retreat and Conference Center's chief executive, accepts a $114,000 check from Bob Bowling, president of Junaluska Associates. Photo from Lake Junaluska. Junaluska Associates presented a check to Jack Ewing, executive director and CEO of Lake Junaluska Conference and Retreat Center, during the group’s annual meeting recently. Ewing said the donation is a testament to Junaluska Associates’ longstanding relationship with and support of the lake and its mission. “For 45 years, the Junaluska Associates have been in partnership with Lake Junaluska Assembly to maintain beautiful grounds and facilities.,” he said. Bob Bowling, Junaluska Associates president, said the group’s members met recently for their annual meeting during the lake’s centennial celebration and decided they wanted to present the retreat center with a birthday gift to honor its 100th anniversary. The Lambuth Inn project, expected to cost about $14 million, will include an addition of meeting rooms and gathering areas on the inn’s north side. Also contemplated is refurbishment of guest rooms and dining facilities at the inn, according to Lake Junaluska’s 2013 Centennial magazine. The project is part of a $40 million revitalization plan for the retreat center, said Ken Howle, Lake Junaluska’s director of advancement. Fundraising is in its infancy, but the staff hopes to break ground on the project within two years. So, who are the Junaluska Associates? The group commits $50,000 annually to a project and then also donates to various ongoing needs as well, Bowling said. So far, the Junaluska Associates have helped finance the walking path around the lake, the Turbeville footbridge that crosses the narrows, the flower gardens, the Biblical Gardens, the lake’s horticulturalist Roddy Ray, the amphitheater, the restoration of the cross, the trolley, the brick colonnade, and the golf cart path and signage at the Lake Junaluska Golf Course. The Associates will also provide limited scholarships for individuals who wish to attend a conference or other event at the lake for the first time, said Mary Skelton, office manager for the group. Junaluska Associates formed in 1968 when the lake was in need of $100,000. As the story goes, Bowling said, a group of leaders from the lake approached one of its trustees, Dr. D.W. Brooks, “a man of some means,” to ask for a loan. Instead of giving the lake the $100,000, Brooks urged the group to find 1,000 people willing to donate $100 each. They did and the idea worked so well that it stuck, thus bearing the Junaluska Associates, an organization now run by a board of directors. The group also has various levels of giving. The annual member gives at least $100 per year. A life member gives a one-time gift of $1,000. A founding member gives a one-time gift of $1,913, in honor of the year the lake was established, and a centennial member, a church or organization, gives a $2,013 gift in honor of the lake’s centennial. The partner membership is a new category that allows a one-time $25 gift to be given in someone’s name. So far, the Junaluska Associates have 916 members and not all of them are Methodists, nor do they all live at the lake, Skelton said. “We have members from Illinois, New Jersey, all over. But most of them are from throughout the Southeast Jurisdiction [of The United Methodist Church]." Recruitment is ongoing, Bowling said. To find out more about Junaluska Associates, call (828) 454-6725, email associates@lakejunaluska.com or visit www.lakejunaluska.com/associates. Office hours are 8 a.m. to noon Tuesdays and Thursdays. -- Melanie Threlkeld McConnell is a writer based in Waynesville, N.C.